The award goes to bloggers who "is intellectually productive, keeping up an active blog with enjoyable content." Of course, it's a sign of my chaotic life at the moment that I receive the Prolific Blogger Award the week that I haven't posted since Monday, missed my weekly Sunday quote, and am so far behind in Google Reader that I didn't even see the award until 5 days after her post. Oh well - I am honored that she thought of me, and excited to share the award with 7 other bloggers (one of whom would have been back to Lisa, but you're not supposed to pass it back to the one who gave it to you... but I still highly recommend that you check out her blog, Bibliophiliac). And, same as Lisa mentioned, these are all blogs that I read regularly and would highly recommend. Enjoy! Congratulations on your award! I really appreciate your passing it on to me! I'm delighted to be included in such august company; thank you! 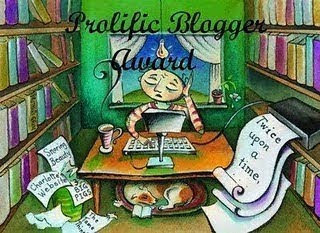 I shall definitely provide my own list of 7 "prolific bloggers" in the next few days.